‘The Australian band’s fourth album of 2017 is a synth heavy psychedelic masterpiece’. Polygondwanaland is King Gizzard & The Lizard Wizard’s fourth album of 2017. Not their fourth album overall – this record actually marks the Australian bands’ twelfth release since their 2012 debut, 12 Bar Bruise – but their fourth album released this very year, with the band due to release another before the year is out. Ambitious it might be, but the imaginatively named King Gizzard are just that – imaginative, and each album released so far this year is nothing short of incredible. Polygondwanaland is no different. So far, 2017 has seen King Gizz release Microtonal Banana (an album composed of only microtonal tunings), Murder of the Universe (split into three parts, with the last chronicling the destruction of the world by a vomiting robot), Sketches of Brunswick East (a psych-jazz fusion collaboration with Mild High Club), and now, Polygondwanaland, an album which is not only polyrhythmic, hence the album’s name, but also completely free. The band released the record through a dropbox and online links, letting fans listen to it for completely free, as well as encouraging people to produce their own CDs and vinyl, and if that’s not a revolutionary idea in a world where music and music streaming is becoming ever-increasingly money-focussed, I don’t know what is. Polygondwanaland is its own album, but it also seamlessly links to the psychedelic rock band’s other offerings from this past year – Leah Senior, the narrator from Murder of the Universe returns on track ‘The Castle in the Air’, and the opening track, ‘Crumbling Castles’, features a riff recognisable from ‘People-Vultures’, off Nonagon Infinity, their 2016 never-ending album (seriously, look it up. Each song joins onto the next, meaning that in theory, the album can be shuffled non-stop forever). 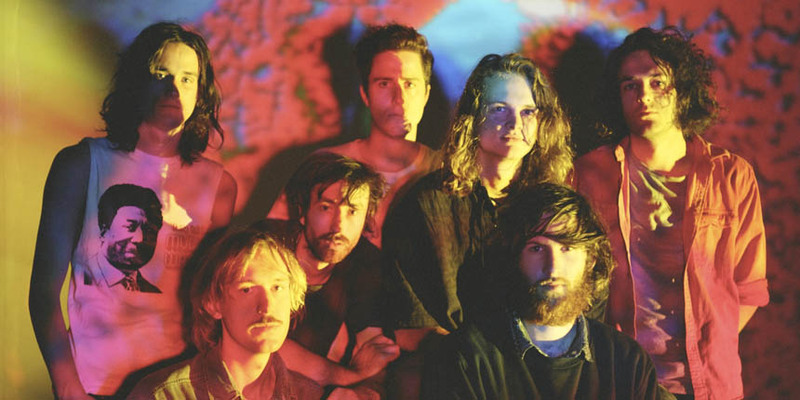 ‘Crumbling Castles’, the opening track, is a ten-minute example of King Gizzard at their psychedelic best, and, honestly, might be one of the best things I’ve heard this entire year. Polygondwanaland is more synth-heavy than King Gizzard’s previous albums, but it still fits so perfectly with King Gizzard’s sound – a sound that is almost impossible to describe, but one that they’ve so completely made their own. Frontman Stu Mackenzie’s vocals are truly superb on the entire record, and evolve and adapt to fit each song, with a decidedly more staccato tone than heard on other albums, and this is heard particularly on the album’s title track, a stunning mix of synth and psych-blues bass. Mackenzie doesn’t just provide vocals, however – back to back songs ‘Loyalty’ and ‘Horology’ feature his flute playing on top of what starts off as a mellow bit of psych blues, before adding guitar (Mackenzie also plays both electric and acoustic guitar for the band, as well as synth and percussion, with the rest of the band being comprised of Michael Cavanagh on drums and percussion, Cook Craig on electric guitar and synth, Ambrose Kenny-Smith on harmonica and vocals, Lucas Skinner on bass and synth, Joey Walker on electric and acoustic guitars, bass, synth, vocals and percussion, and Eric Moore, the band’s manager, as well as drummer and percussionist), and a clear example of the polyrhythms that gave their name in part to the album’s title. The last three songs of the album are, for me, the standout tracks of the record – ‘Tetrachromacy’, ‘Searching…’, and ‘The Fourth Colour’, which signal something of a change within the album, with less synth particularly on ‘The Fourth Colour’, a song which itself almost constantly changes musical styles throughout its six minutes, and instead features guitars which sound almost reminiscent of Television’s ‘Marquee Moon’. The ending of ‘The Fourth Colour’ is electric, every bit a psychedelic experience, and is the perfect end for such a journey of an album. Polygondwanaland is proof, if anymore was needed, that King Gizzard are one of the most exciting, innovative and talented bands currently creating, and with one more album due to be released before 2017 is out, it’s doesn’t look like they’re going to stop creating wildly imaginative concept albums anytime soon.